Paul Fleck had the pleasure of speaking amongst a panel at the Old Persons’ Commission in Rochester, MI on November 5th of 2018. 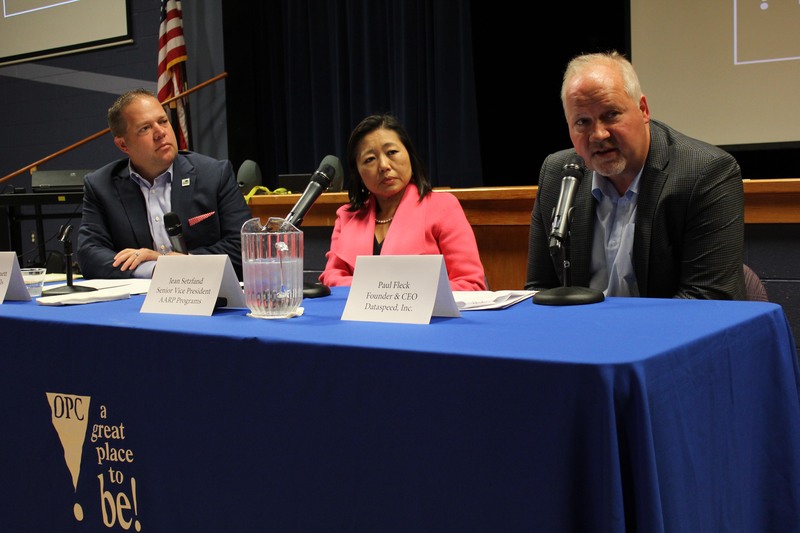 The panel was a session amongst Mayor Barnett’s “Monday’s with the Mayor” and was focused on how the introduction of autonomous vehicles will impact senior living. Mayor Barnett and Jean Setzfand, Sr. Vice President of AARP Programs, joined Paul in conversation. Topics touching on the below were discussed with focus on how autonomous vehicles may be the answer to extending the age at which people “drive”. The number of Americans ages 65 and older is expected to reach roughly 98 million by 2060. * This is nearly double today’s population. With the aging population at an all time high, the number of car keys being taken from persons no longer capable of driving is greater than ever. Individuals often bound by four walls and limited public transportation may regain a sense of freedom with the introduction of self-driving vehicles. No longer is the need to rely on family or friends for transporting to and from appointments, running errands, and other daily activities. The older community may often be late adopters to new technology, but autonomous vehicles may be just the exception due to the need for mobility. Automakers will need to consider senior citizen budgets, comfort expectations and learning behaviors in order for the elderly community to “take the wheel” on driverless cars. Many older individuals are living on fixed incomes; therefore, autonomous vehicles will need to be a financially realistic solution. In addition, physical limitations, such as impaired vision and hearing, are common occurrences and will need to be addressed in the construction of vehicle controls and alerts. Commitment and patience should be priorities for brands when implementing training and support programs for new purchases. With trust from seniors and dedication from automotive companies, autonomous vehicles will bridge the mobility gap of the aging population. Dataspeed’s drive-by-wire technology has been retrofitted to several Ford Fusions that were part of Voyage’s launch of self-driving cars in a retirement community. Voyage, an innovative California-based company, is determined to super-charge communities with autonomous vehicles. This deployment was designed to enhance each resident’s quality of life. The initiative took place in The Villages, a 55+ California neighborhood with approximately 4,000 residents. The vehicles were developed to navigate the fairly complex roads while monitoring for possible pedestrian and golf cart crossings. For added safety in this initial deployment, an individual is behind the wheel in the event the car needs to be manually taken over. The very first rider, a blind elderly woman, stated she believes that with continuing research, she’d be apt to trust a self-driving car over most human drivers. With the use of Dataspeed’s drive-by wire technology, Voyage was able to rapidly dispatch the first fleet of vehicles and begin improving resident’s everyday lives at The Villages.